Doing a big purge of your home is standard new year fare. However, doing a deep clean of your cleaning gear is less typical, but many would say equally (if not more) important for your well-being. 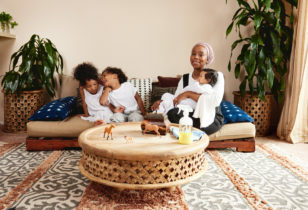 According to multiple studies, creating a non-toxic—or less-toxic—home has numerous health benefits. Research has found that frequent use of harsh cleaning ingredients (like bleach and disinfectants) is linked to an increased chance of chronic lung disease. Additionally, a 2013 study in Spain found that moms who used spray cleaners and air fresheners in their homes during and after pregnancy were significantly more likely to have children that experienced wheezing and respiratory infections as infants. Not to mention, Americans have an unsettling obsession with and reliance on paper towels that outpaces any other country. It’s said that paper towel use in the U.S. wipes out 94,000 trees a day, which amounts to nearly 35 million trees every year! 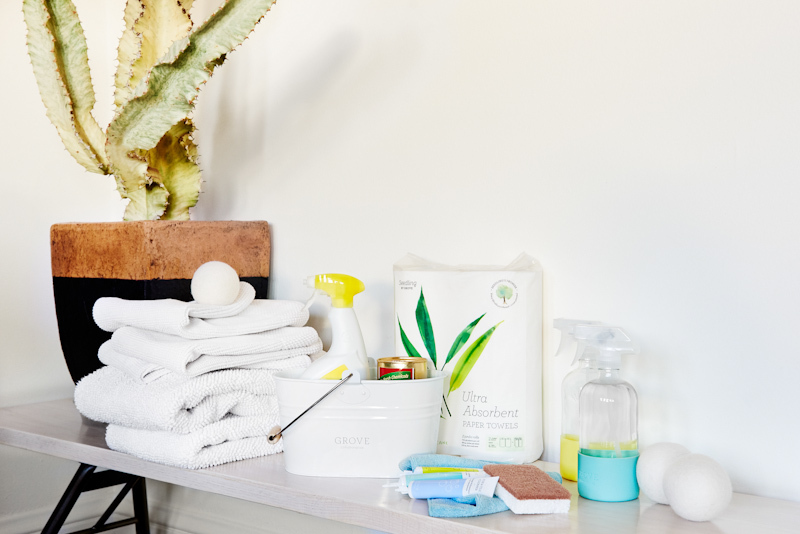 To help you clean up your act when it comes to at-home cleaning, the folks at Grove Collaborative have got you. 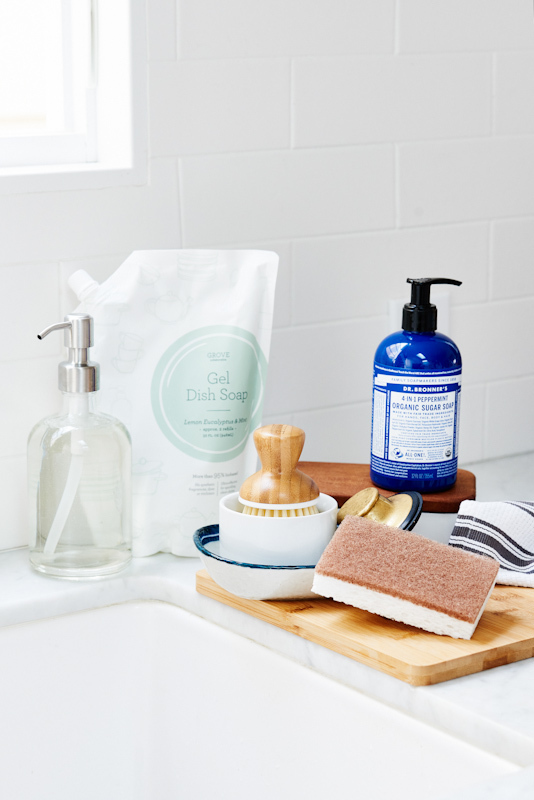 The e-retailer has a site filled with thoroughly vetted green cleaning products, including crowd favorites Dr. Bronner’s, Bon Ami, and Seventh Generation, as well as the company’s in-house label. 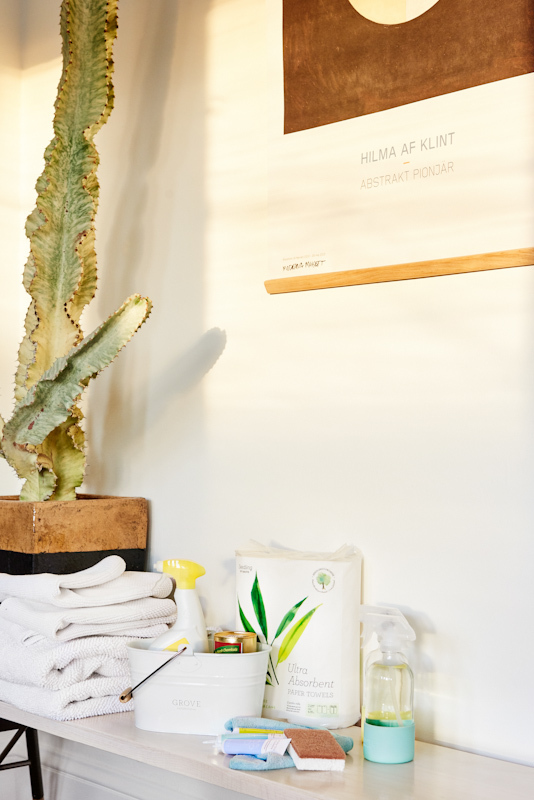 Some highlights from the exclusive Grove brand include the tree-free line of Seedling by Grove paper towels, tissues, and toilet paper, as well as cleaning concentrates that simply need to be mixed with water in order to use, cutting down on plastic waste and the eco-footprint of shipping heavy, water-logged cleaning supplies around the country. To try Grove out for yourself, simply click here to get started. 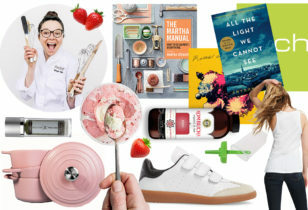 Every new customer who spends $20 will score a free gift set, which includes a 3-pack of Grove Collaborative Cleaning Concentrates, a Grove Collaborative Glass Spray Bottle, the brand-new design of Grove Collaborative’s Cleaning Caddy, and a 2-pack of Grove Collaborative’s signature Walnut Scrubber Sponges. Meanwhile, new customers who spend $39 or more will receive all of the above, plus a free Grove ceramic sink-side tray. Existing customers will score a free set of sponges. 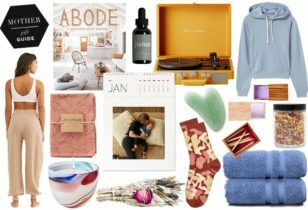 We recently tried out Grove for the very first time ourselves and are showing you the beautiful green products we picked out for the kitchen, bathroom, bedroom, and cleaning shelf. Check them out in our slideshow below and get inspired to customize your own first shipment right here. This post is brought to you by Mother x Grove Collaborative. 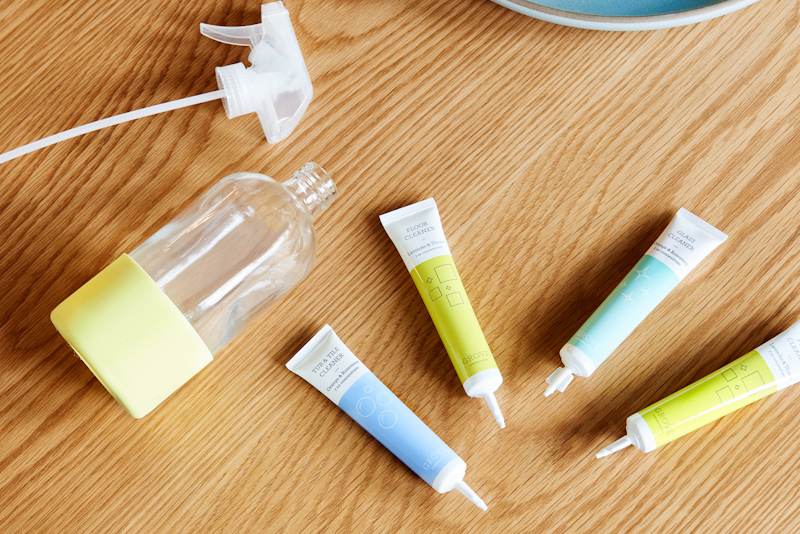 All brands on Grove's site must adhere to the following standards: They must be cruelty free, paraben free, phthalate free, BPA free, and formaldehyde free. All sunscreens are reef safe. When it comes to Grove's in-house brand, there are also no synthetic fragrances or synthetic colorants used. Additionally, one of the goals of Grove is an overall reduction of one-use plastic. 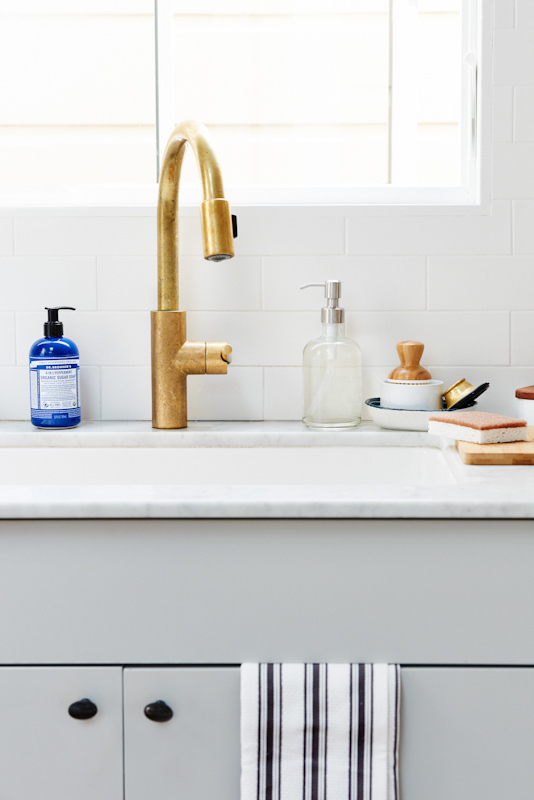 Grove explains that by using its concentrates collection, combined with its glass hand soap dispenser and dish soap dispenser, customers can reduce their one-time household plastic use by 80%. Glass Hand Soap Dispenser, $10.95, Grove Collaborative. Gel Dish Soap, $5.95, Grove Collaborative. Bubble Up Dish Soap Dispenser & Brush Set, $12.95, Grove Collaborative. Walnut Scrubber Sponge, Set of 2, $3.95, Grove Collaborative. Dr. Bronner's Organic Sugar Soap, $9.99, Grove Collaborative. 100% Organic Kitchen Towel, $5.95, Grove Collaborative. Bamboo Prep Board, $9.95, Grove Collaborative. 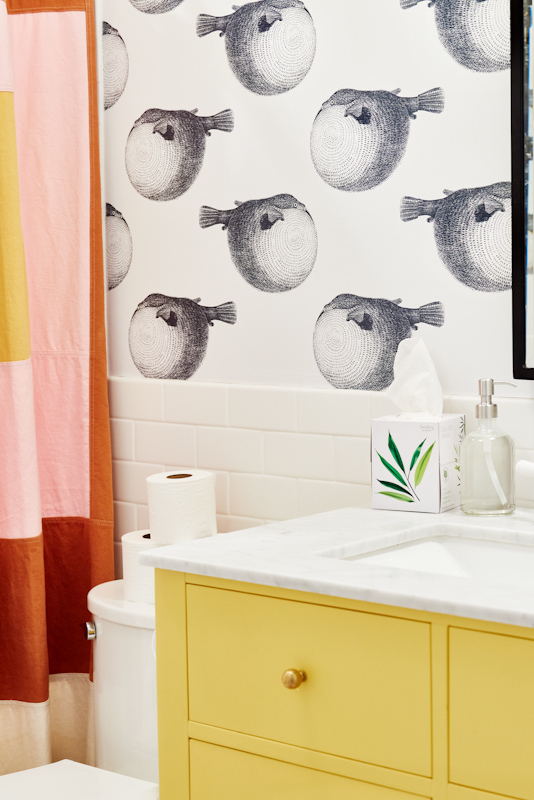 Grove's Seedling paper is a tree-free alternative to conventional toilet paper and tissue. And it's not only tree-free, but tree positive—no trees were cut down in the production of it and Grove will actually plant trees when you purchase Seedling. In partnership with the Arbor Day Foundation, Grove's goal is to have 100,000 new trees planted in the U.S. in 2019. Instead of conventional paper from trees, Seedling paper is made of bamboo that is sustainably farmed in China and mixed with bughasse, a wasted byproduct of sugarcane. Because Bamboo is fast growing, it can be harvested four times a year, whereas a tree take 20 years to grow to its full potential. 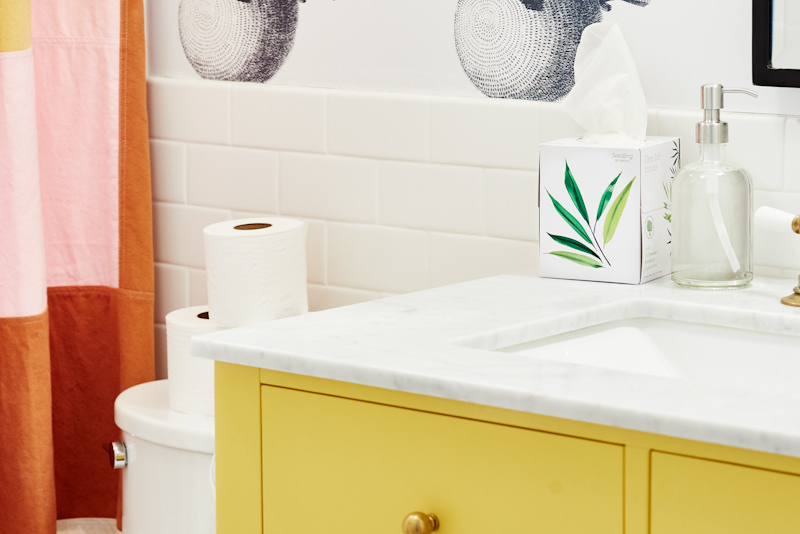 Tree-Free Jumbo Roll Bath Tissue, $7.95, Grove Collaborative. Tree-Free Facial Tissue, $1.95, Grove Collaborative. 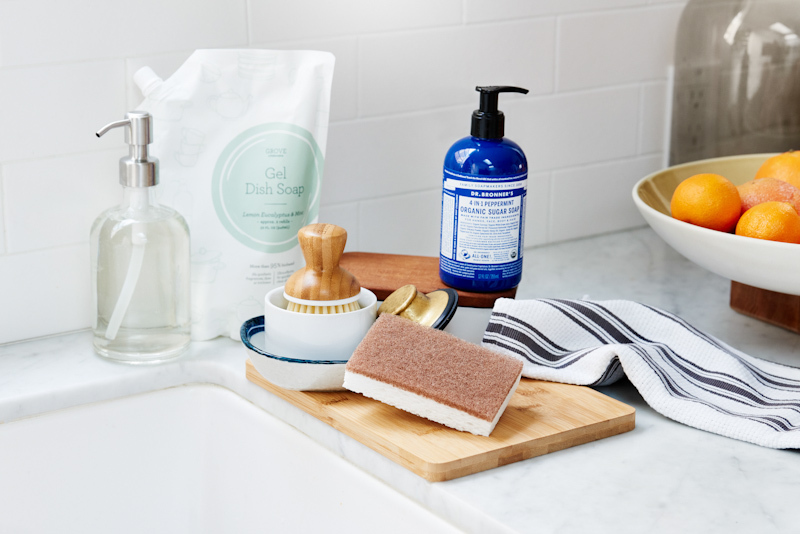 Hand Soap Starter Set, $14.95, Grove Collaborative. 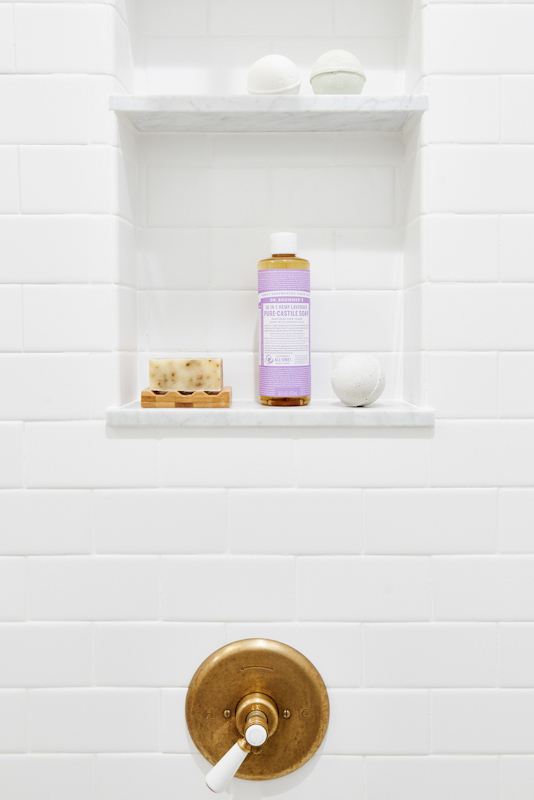 Dr. Bronner's Pure-Castile Liquid Soap, 32 Oz. Bottle, $16.99, Grove Collaborative. Bamboo Soap Saver and Bar Soap Set, $7.95, Grove Collaborative. 100% Natural Bath Bombs, Set of 3, $12.95, Grove Collaborative. Did you know that most cleaning and conventional laundry products are 95% water and only 5% actual formulation? To reduce both one-time plastic use and to decrease the transport of heavy, water-filled cleaning supplies across the country, Grove suggests using one of its glass spray bottles, filled with water from the tap, and mixed with one of its compact and lightweight cleaning concentrates. 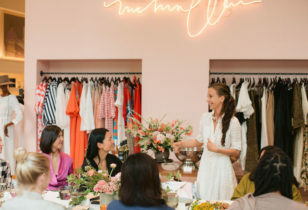 When it comes to laundry, Grove suggests ditching dryer sheets packed with toxic chemicals in favor of its wool dryer balls, which contain zero chemicals, can cut your drying time in half, and can be used for up to 1,000 loads. Just add a few drops of essential oil for a gentle and natural scent. Glass Spray Bottle with Silicone Sleeve, $12.95, Grove Collaborative. Cleaning Concentrates, 3 Pack, $7.95, Grove Collaborative. Wool Dryer Balls, Set of 3, $15.95, Grove Collaborative. Cleaning Caddy, $14.95, Grove Collaborative. Seventh Generation Tub & Tile Cleaner, $3.99, Grove Collaborative. Bon Ami Powder Cleanser, $1.49, Grove Collaborative. Tree-Free Paper Towels, $9.95, Grove Collaborative. All-Purpose Microfiber Cloth, Set of 2, $7.95, Grove Collaborative. As an alternative to home fresheners using synthetic fragrances, we love Grove's beautiful glass spray bottle filled with water from the tap mixed with a few drops of one of your favorite essential oils. A natural way to freshen up any room in your house. 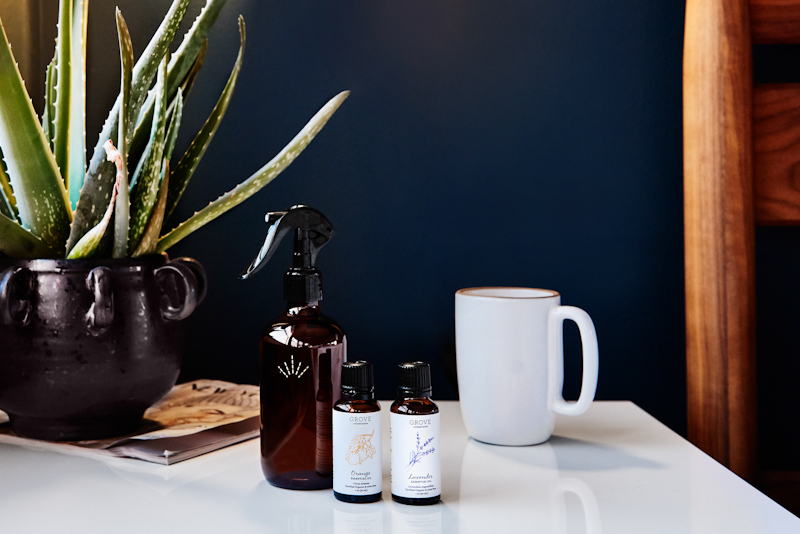 Glass Room Spray Bottle and Essential Oil Set, $19.95, Grove Collaborative. For more greener cleaning supplies options, head over to Grove Collaborative.